It’s no accident that Eliza Mathis and Kelly McLaughlin share this story; it’s a natural extension of the relationships and collaborative efforts that the HDI Higher Education Forum (HEF) has fostered. It’s a story of shared experiences and shared outcomes. It’s a story of collaboration and teamwork. It’s a story that transcends boundaries between small liberal arts colleges and large state institutions. And it’s a story of personal and professional relationships that carry forward into lifelong friendships. Eliza is the director of IT service management at the University of South Carolina, South Carolina’s flagship university. Eliza’s department was in a state of reorganization. They were reevaluating their service delivery strategy around the help desk, desktop support, laptop support for students, and the wide range of other service demands they were facing. Both directors joined the HEF, eager to network with and learn from professionals from other higher education institutions that were experiencing similar challenges. It became evident rather quickly how similar the problems, issues, desires, goals, and visions were across all of the participating institutions, regardless of size. The members got to know each other quite well through the HEF meetings and active participation in the group’s listserv, which led to a very high level of trust. Eliza and Kelly took that collaborative spirit a step further. 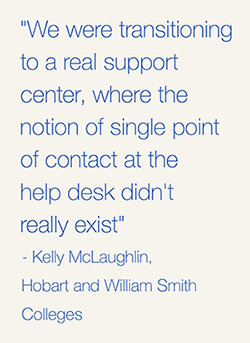 At Hobart and William Smith Colleges, Kelly had recently hired new employees and was looking for ways to advance the team culture, bring people together, and establish a new foundation for their service desk. Kelly remembered a conversation she had with Eliza during an HEF meeting some months before about the work her team had done on vision and mission statements. The seed was planted. “My team still talks about it today,” says Kelly. “Not only did it generate tangible results in the form of vision and mission statements, but it brought my team closer together in a way that I don’t think I would have been able to do on my own.” Sending twenty people to a training class or bringing in an outside consultant to facilitate the customized workshop would have been cost prohibitive, so the collaborative effort also saved Kelly’s institution thousands of training dollars. For this puzzle, you need two people, some rope, and some empty space. Each person will need a piece of rope with a loop tied in both ends, so it can be worn as handcuffs. The rope should be reasonably long so that the person wearing it can step over it. The handcuffs cannot be removed. Do not break, cut, saw, bite through, or in any other way damage the rope. Damaging each other is probably a bad idea, too. If you are doing this puzzle with a class, make sure you tell them they need to be able to show you their solution. Otherwise it wouldn’t be so much fun! Not sure about joining? You can register to attend a free upcoming Forum Roundtable event to experience a Forum meeting on a smaller scale. The HDI Leadership Connection Membership is a top-of-the-line membership, bringing together elite groups of senior-level professionals who meet face-to-face multiple times per year. These groups are the HDI Forums. The HDI Leadership Connection Membership includes your choice of one HDI Forum annual package. The HDI Forums serve as a valuable opportunity for support leaders to learn, network, share ideas and experiences, and to discuss the latest developments in support center best practices with peers who work in similar industries or share similar roles and responsibilities. Participants gain fresh perspectives on world-class support and ideas about how to improve the people, process, and technology strategies within their support center. There is no better place to connect and exchange knowledge and information with other service and support managers, directors, and executives than the HDI Forums. HDI Forums offer you the opportunity to connect with some of the brightest and most driven in the industry resulting in both enhancing your own performance and your organization’s, and help the industry at large.